The Raj Ghat is the memorial of Mahatma Gandhi, the father of nation. It the final resting place or cremation site of Mahatma Gandhi. Located on Ghat on the banks of Yamuna River, the Raj Ghat has been one of the most south after attractions for tourists coming from different parts of the world. It is a simple square platform of stunning black marble that marks the spot where Rashtrapita Mahatma Gandhi was cremated following his assassination in the year 1948. An eternal flame burns at the end of the Raj Ghat Platform. Visitors with shoes are not allowed to enter the Raj Ghat memorial. All visitors are required to remove their footwear, sandals, sleepers and shoes outside before entering to the memorial wall. The memorial is surrounded by a beautiful park and garden consisting of lush green lawns and labelled trees. Apart from the Raj Ghat memorial dedicated to Mahatma Gandhi, there are several other memorial sites or cremation spots dedicated to other famous leaders and personalities of India. On our visit to Raj Ghat Memorial, you can visit Shanti Vana (the cremation site of Jawaharlal Nehru, the first Prime Minster of India), Ekta Sthal (the cremation site of K. R. Narayanan, the tenth President of India), Shakti Sthal Memorial (the cremation spot of Indira Gandhi, the 3rd Prime Minster of India), Vijay Ghat (the Memorial dedicated to Lal Bahadur Shastri, India’s second Prime Minister), Veer Bhoomi ( a memorial dedicated to Rajiv Gandhi, India’s 6th Prime Minister), Sanjay Gandhi Memorial. There are also memorials of other leaders like Jagjivan Ram, Choudhary Charan Singh, Giani Zail Singh, Shakar Dayal Sharma, P.V. Narasimha Rao, Chandra Shekhar, and I.K. Gujral near the Rajghat memorial site. Rajghat is open to all days between 10 AM and 5 PM. There is not entre fee. Photography is not banned here. Hence, you can take snaps for memories of Rajghat visit. You can reach the Rajghat Memorial Site easily. It is located at the distance of only 4 kilometers away from Janpath in New Delhi. The nearest Railway Station is New Delhi Railway Station. The nearest Metro Stations to access the Rajghat is Indraprastha Metro Station. 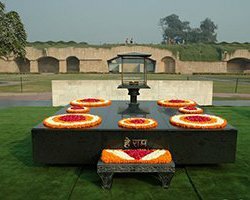 You must visit the Raj Ghat and other associated memorials on your Delhi sightseeing tour. Exploring the Raj Ghat Memorial along with memorials of other Indian leaders and famous personalities will give a great tourism experience to relish for the lifetime.